"Black Luster Soldier" + "Blue-Eyes Ultimate Dragon". This monster cannot be Special Summoned except by Fusion Summon. This card gains 500 ATK for each Dragon-Type monster on your side of the field ex..
"Drill Synchron" + 1 or more non-Tuner monsters. Once per turn, during your Main Phase, you can halve this card's ATK (permanently). If you do, it can attack your opponent directly this turn. Once per.. This Fusion Material Monsters for this card are any 5 Dragon-Type Monsters. This monster cannot be Special Summoned except by Fusion Summon. This card does not take any Battle Damage and cannot be des..
Elf twins that alternate their attack.. This card cannot be Normal Summoned or Set. 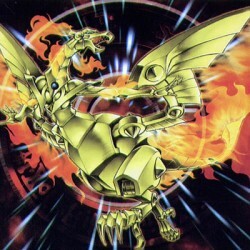 This card cannot be Special Summoned except by the effect of "Horus the Black Flame Dragon LV6". While this card remains face-up on your side of the field, ..
During your Draw Phase, if this card is in your Graveyard, you can add this card to your hand instead of drawing, and/or send 1 "Koa'ki Meiru" monster from your hand to your Graveyard to add this card..
"Discard 1 card from your hand to negate the activation and effect of a Spell Card controlled by your opponent that includes the effect of destroying Spell and/or Trap Card(s) on the field and destroy..
During each of your End Phases, destroy this card unless you send 1 "Iron Core of Koa'ki Meiru" from your hand to the Graveyard or reveal 1 Rock-Type monster in your hand. You can Tribute this card to.. When this card is Normal or Special Summoned, you can destroy up to 2 cards on the field. For each card destroyed, that card's controller draws 1 card. This card cannot attack during the turn it is No..